Hello everyone, Rachel here. I am so very happy to be part of Vicki’s creative team and I am looking forward to sharing my tutorials here on this site. I hope to bring ease and understanding of Photoshop but more importantly easy ways for you to use all those beautiful digi supplies you have. Since people learn in different ways I share my tutorials on the blog, YouTube videos and downloadable PDF file with pictures and step-by-step instructions. Today’s tutorial is all about automation. Specifically, automating your Brush files in Photoshop that takes out a lot of the thought process and tells Photoshop to change the size, angle and spread of your Brushes so you can quickly create a background. 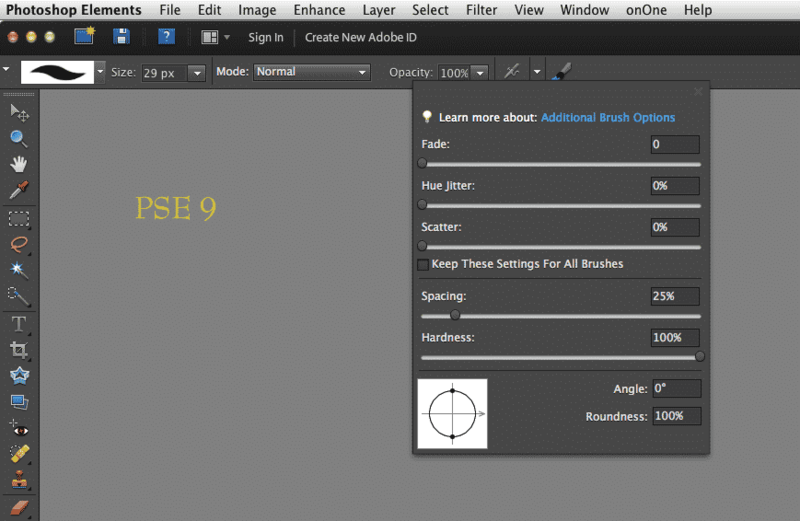 For Photoshop Elements users, you will find most of the same options in the Brush settings dialog box. I have inserted screen shots for PSE 11 and PSE 9 in Step 3. Step 1: I am starting off with a plain patterned paper. For this tutorial I am using paper from the It’s About Time kit. You want to choose a paper with little imagery or texture because we are going to create our own background. Step 2: Create a new Layer and rename it. I am renaming mine to the Brush file I plan on using which is 2211. However, please note: the Brush number listed in Photoshop is actually the pixel size and not the name of the file. If you are using the PNG file the name is different. I will use the Bubble Wrap Brush files. I am starting out with Brush #2211, which is a beautiful bubble wrap image. Step 3: Next I am going to go to the brush preset menu/tab and this is where I will tell Photoshop to automatically change the size, angle and spread of the bubble wrap brush each time I stamp down. 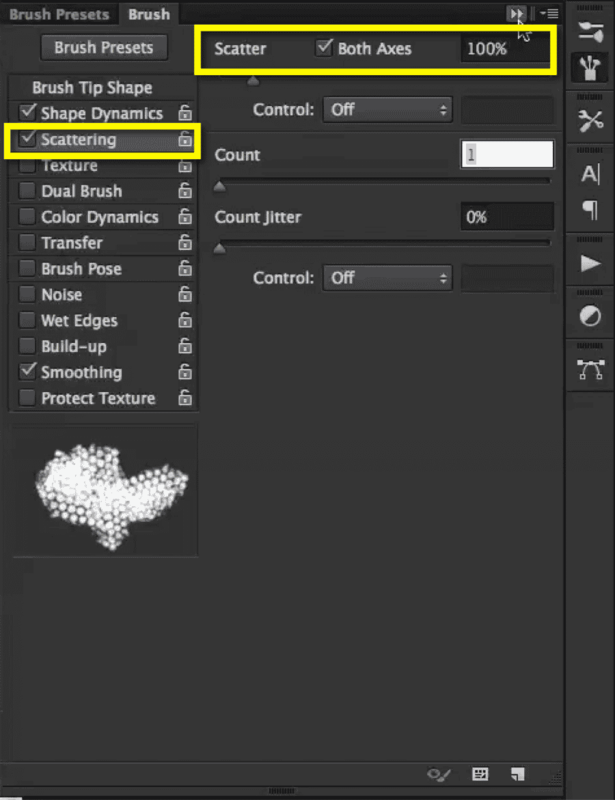 You will want to change the Shape Dynamics and Scattering menus to exactly as shown below. Step 4: Set your foreground color to black. Then begin to stamp down onto your paper. After each time you stamp down you will see the size, angle and spread of your brush change. That is Photoshop automating the process for you. Keep stamping in various areas of the page randomly. Don’t be alarmed at all the black images we are going to fix that in a moment. You are building a background and the more coverage you have on the paper, the better! Step 5: Now here is the cool part, we are going to make the black color disappear (like magic) and just leave us with the texture of the bubble wrap! This is very simple to do. 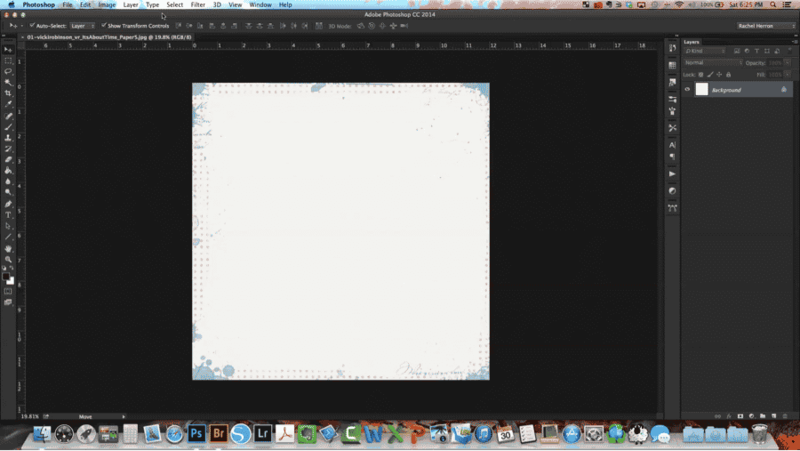 Go to the Blend Modes drop down menu while making sure you are still on the bubble wrap Layer. Change the blend mode to Overlay. How cool is that? 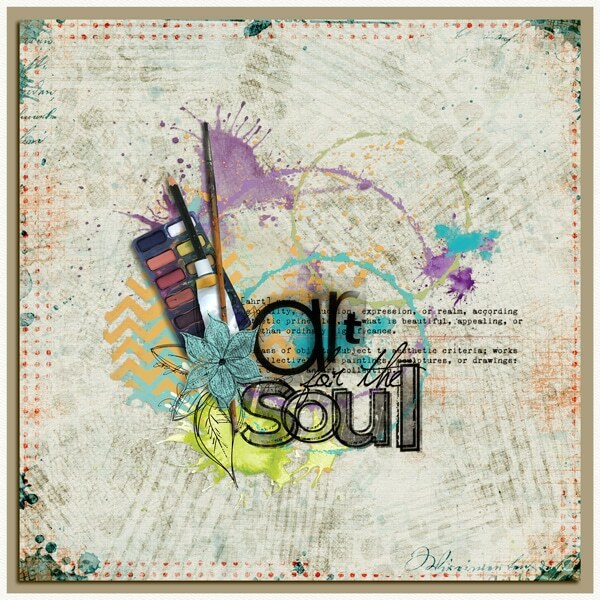 You are left with the beginnings of your background/texture for your project and Photoshop did all of the work! For this project I continued to layer on more texture by repeating the same steps and adding three more brushes. 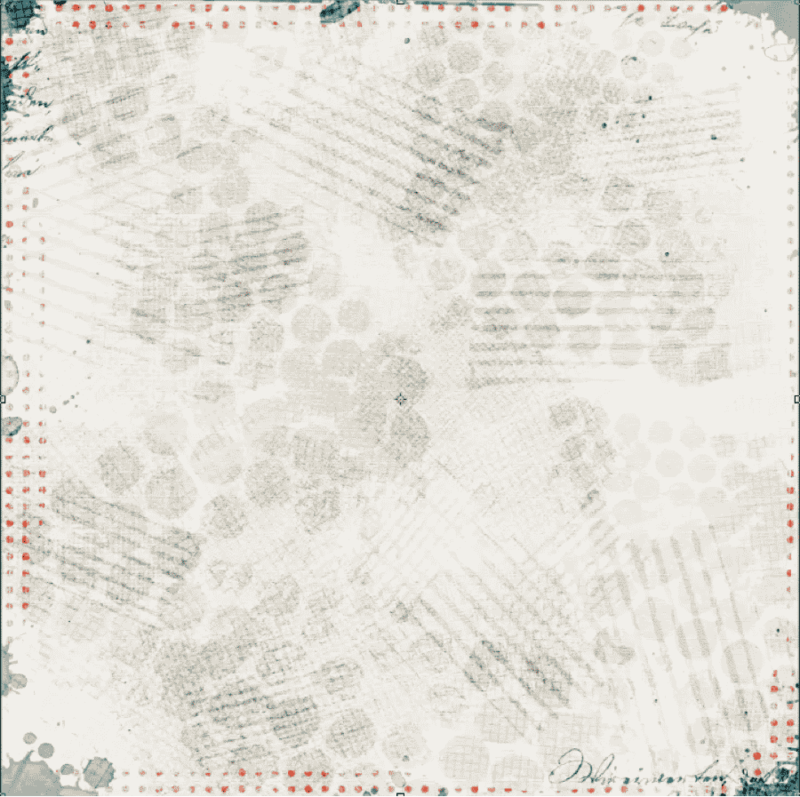 Below is a look at my background paper after adding all the texture and stamps. Here is a closer look at my finished page. To see this tutorial in action here is a video. You can also download a copy of the PDF instructions here – (right click and choose Save Download. Rachel, you do a mean tut! LOL That’s so cool! I’m going to go play right now ’cause I have those brushes! Thank you for the tut and the loverly word art cluster! Too funny. Thanks Su. Enjoy! Rachel’s great, isn’t she, Su? She sure is! You are blessed! Am I mistaken or is Rachel, yeah, you, if you’re seeing this, too, a tutorial writer for another designer, also? I am familiar with you(Rachel) to the point that I think I have seen you somewhere else. If it’s none of my business, no problem. Just curious! Hi Su, yes it’s me! I am happy to be working with both Vicki and Amber. Oh, my! Well good! Vicky, Courtney and Amber are my top faves.I think I see now why! You are fab in the designs! Thanks so much for the tutorial, Rachel! I don’t have photoshop or elements, but it is such a straight forward tut that I *think* I can make it work on my program. *fingers crossed* 🙂 Thanks for the cluster, too, it’s gorgeous, thanks, also to Linda and Vicki! So glad you like it and will try it in another program 🙂 Good luck. You’re quite welcome, Johanna! Enjoy! Awesome tutorial Rachel, very detailed and easy to follow. Thanks Frani. Hope you have fun and give it a try. Fran, so glad you liked the tutorial! OMG…automating the turning of the brush for random stamping…GENIUS!!!!! Cool, right? I love, love LOVE brushes! Oh so glad you liked the tutorial Robin! Brushes are so much fun!! So glad you liked the tutorial, Alanna! Thank you. I am glad you liked it. Brushes are so much fun!